Arrive at Ben Gurion International Airport and transfer to your hotel. Enjoy this evening's welcome drink with your travelling companions,hosted by your Tour Director. Start your tour of the Holy Land with Caesarea,the perfect place to learn about the Roman and Crusader presence in the country. Visit the Roman Amphitheater and the impressive Crusader Fortress, and admire Herod's Stadium and harbour. In the afternoon, travel to the ancient fortified city of Megiddo, regarded as one of the most important biblical sites in Israel. This is the famous battle ground where armed struggles of Assyrians, Canaanites, Egyptians, Greeks,Israelites, Persians, Philistines, and Romans took place. According to the New Testament, Armageddon will serve as the gathering place for an army that will fight in the battle that causes the return of Jesus Christ (Revelation 1:10). Next, continue along the coast through Baron Edmond de Roths child's vineyards and apricot groves to the slopes of the scenic Carmel mountain range. At Muhraqa, site of Prophet Elias' contest of faith with the priests of Baal, enjoy a sweeping panoramic view of the fertile Jezreel Valley. Via the Druze village of Daliyatel-Carmel you reach Haifa, a city with a long history dating back to biblical times. Enjoy a visit to the golden-domed Baha'i Shrine, the world centre of Baha'ifaith. Next, visit Acre, a UNESCO World Heritage Site, at the northern end ofthe lovely Bay of Haifa. Acrebe came the capital of the Crusader kingdom after its conquest by Richard the Lion heart. Marvel at the forbidding Ottoman fortress and tour the excavated part of the immense underground Crusader City with its secret passage ways and the vaulted crypt of the Knights of St. John. On to Nazareth in Galilee,chief scene of the ministry of Jesus Christ. Here, visit the contemporary Church Of The Annunciation. Continue to St.Joseph's Church, built over a cave known as St. Joseph's Workshop, and pass by Mary's Well and the Church of the Angel Gabriel. Next, travel on to Cana, site of the first miracle, where Jesus changed water to wine at a wedding ( John 2:1-12). Due to this, many couples renew their wedding vows at this sacred place. Also see an ancient fisherman's boat said to be from the time of Christ before arriving at the Kibbutz. Time to relax or to swim before dinner. This evening you are invited for a Lecture On kibbutz Life . Heading towards the Sea of Galilee, visit the Mount Of Beatitudes, where Jesus delivered his Sermon on the Mount. Next, visit the Church Of The Multiplication Of Loaves and Fishes at Tabgha as well as the Church Of St. Peter's Primacy, where Jesus instructed Peter "to feed my lambs and tend my sheep" ( John 21:15-19). 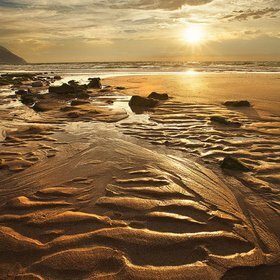 At this place, warm springs used to flow into the sea, attracting fish, which is why Peter came here to earn a living. On to Capernaum, where Jesus recruited his first followers among the fishermen. After wards, enjoy a 45-minute cruise on the Sea of Galilee. Via the ruins of Kursi, which memorialise two of Jesus' miracles, arrive at the Jordan River and visit a Baptismal Site. Then,visit the ancient city of Bet She'an with its fine Roman and Byzantine Relics. The city is located at the foot of Mount Gilboa, where King Saul and his son died by their own hands in battle with the Philistines. On the way to Jerusalem, stop for a breath taking panoramic view of the Holy City, considered one of the oldest places in the world with a history dating back as far as 4000 BC. This morning, drive to Ein Karem and visit the Church of St. John The Baptist and the Church Of Visitation, said to be built over the home of John the Baptist's parents. Enjoy a beautiful view of the valley and the surrounding wooded hills. Continue to Bethlehem and see Shepherd's Field, where the angels announced the birth of Jesus. Next, visit the Church Of The Nativity, which stands on the site where Jesus was born. On the way back to Jerusalem, visit the Garden Tomb, where you will enjoy the scenery of the beautiful holy garden. Tonight, perhaps an optional Israeli folklore show with dinner. Drive through the Judean wilderness to the Dead Sea, the lowest point on the surface of the Earth. Enjoy the scenery as you follow the road between the salty water and majestic desert mountains. Catch glimpses of the Caves of Qumran, where the precious Dead Sea Scrolls were found. Ascend by cable car to the spectacular clifftop Fortress of Masada, and hear how 960 Jewish zealots preferred death at their own hands to the in dignity of surrender to overwhelming Roman forces. Around lunch time, reach one of the comfortable Dead Sea resorts. You will have plenty of time here to experience the feeling of buoyancy in the heavy water. Then, back to Jerusalem. After a panoramic view from the Mount Of Olives over the old and modern parts of the city, start your guided walking tour. Via the Chapel of Dominus Flevit, where Jesus wept over Jerusalem, arrive at the Garden Of Gethsemane.Here, see the Rock of Agony, where Jesus prayed his last prayer before hisarrest. Nearby are the Cave of the Assumption of Mary and the Cave of Betrayal.Follow the Stations of the Cross along the VIA Dolorosa to Golgotha, and visit the Church Of The Holy Sepulchre. Erected over the site of the cruci fixion, this church is shared by six Christian communities.Walk past the Temple Mount, from where you can see the Dome of the Rock, a splendid mosque on the holy mount. On to the Wailing Wall, the most holy shrine in the Jewish religion. Then, stroll through the restored Jewish quarter to Mount Zion and visit the Upperroom, the Tomb Of King David, and the House Of Caiaphas, where Jesus was kept the night after he was arrested. A full day at leisure with time to attend Mass in one of the Jerusalem churches.Later, maybe join your Tour Director on an optional excursion featuring the synagogue of Hadassah Hospital with its famous Chagall windows, representing the 12 sons of the Patriarch Jacob, who formed the Twelve Tribes of Israel. Continue to the Israel Museum with the Shrine of the Book and the Dead Sea Scrolls, the oldest Bible in the world, and the model of Jerusalem in the Second Temple Period. Also visit the famous Holocaust Memorial at Yad Vashem. Take the scenic winding road through Wadi Sorek towards the ancient land of the Philistines. In the Valley of Elah, stop at the site of David's victory over the Philistine champion, Goliath, and hear about this biblical event (Samuel 17:1- 58). Later, refresh your memory with the tale of Samson and Delilah ( Judges 16:1-20) as you proceed through the land of the Dantribe to the wide Valley of Ayalon. At strategic Latrun you visit the Monastery Of The Trappist Monks. Then, stop near the ruins of the basilica that is said to be the site of Emaus, where Jesus manifested him self to two of his disciples (Luke 24:13-35). Continue along the Mediterranean shore and stop in Jaffa for a walk through the beautifully restored ancient port, where medieval pilgrims started their strenuous 2-day trek to Jerusalem.This evening, enjoy a farewell dinner with your travelling companions of an unforgettable journey through the Holy Land. Arrive at Ben Gurion International Airport and transfer to your hotel. Enjoy this evening's welcome drink with your travelling companions, hosted by your Tour Director. Enjoy a visit to the golden-domed Baha'i Shrine, the world centre of Baha'ifaith. Next, visit Acre, a UNESCO World Heritage Site, at the northern end ofthe lovely Bay of Haifa. Acrebe came the capital of the Crusader kingdom after its conquest by Richard the Lion heart. Marvel at the forbidding Ottoman fortress and tour the excavated part of the immense underground Crusader City with its secret passage ways and the vaulted crypt of the Knights of St. John. On to Nazareth in Galilee,chief scene of the ministry of Jesus Christ. Here, visit the contemporary Church Of The Annunciation. Continue to St.Joseph's Church, built over a cave known as St. Joseph's Workshop, and pass by Mary's Well and the Church of the Angel Gabriel. Next, travel on to Cana, site of the first miracle, where Jesus changedwater to wine at a wedding ( John 2:1-12). Due to this, many couples renew their wedding vows at this sacred place. Also see an ancient fisherman's boatsaid to be from the time of Christ before arriving at the Kibbutz. Time torelax or to swim before dinner. This evening you are invited for a Lecture On kibbutz Life. After a panoramic view from the Mount Of Olive over the old and modern parts of the city, start your guided walking tour. Via the Chapel of Dominus Flevit, where Jesus wept over Jerusalem,arrive at the Garden Of Gethsemane. Here, see the Rock of Agony, where Jesus prayed his last prayer before his arrest. Nearby are the Cave of the Assumption of Mary and the Cave of Betrayal.Follow the Stations of the Cross along the Via Dolorosa to Golgotha, and visit the Church Of The Holy Sepulchre. Erected over the site of the crucifixion, this church is shared by six Christian communities.Walk past the Temple Mount, from where you can see the Dome of the Rock, a splendid mosque on the holy mount. On to the Wailing Wall, the most holy shrine in the Jewish religion. Then, stroll through the restored Jewish quarter to Mount Zion and visit the Upper Room, the Tomb Of King David, and the House Of Caiaphas, where Jesus was kept the night after he was arrested. A full day at leisure with time to attend Mass in one of the Jerusalem churches. Later, maybe join your Tour Director on an optional excursion featuring the synagogue of Hadassah Hospital with its famous Chagall windows, representing the 12 sons of the Patriarch Jacob, who formed the Twelve Tribes of Israel. Continue to the Israel Museum with the Shrine of the Book and the Dead Sea Scrolls, the oldest Bible in the world, and the model of Jerusalem in the Second Temple Period. Also visit the famous Holocaust Memorial at Yad Vashem. Transfer to the airport for your flight to Amman, Jordan. Next is Bethany Beyond the Jordan, where Christians believe that Jesus was with a stop at Lot's Cave along the way. Drive along the Dead Sea and arrive in the "rose-red city" of Petra. Relax at your hotel this evening or explore the ancient capital of Jordan. Full day of guided sightseeing in Petra,a UNESCO World Heritage Site and one of the New 7 Wonders of the World. Lost to the world for centuries, it is located in the biblical land of Moab. Enjoy an unforgettable experience as you walk down the Siq, the narrow gorge made famous in the movie Indiana Jones and the Last Crusade. Stand in awe infront of the iconic and famed Treasury. 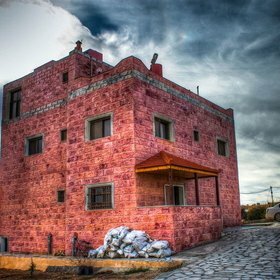 In addition to seeing numerous spectacular temples and tombs created out of the rose-coloured sandstone, siptea in a Bedouin Tent. This morning visit the Crusader Castle and Wadi Mujib, the "Jordanian Grand Canyon". Continue to Mukawir, where Salome danced and John the Baptist was imprisoned and be headed. Then, onto Madaba to visit St. George's Church, which houses a precious 6th-century mosaic map of the Holy Land. Also explore the Madaba Archaeological Museum. One of today's major highlights is a visit to Mount Nebo, where Moses saw the Promised Land. Continue to your hotel at the Dead Sea for your two-night stay. The morning is dedicated to Jerash, the best-preserved Greco-Roman city in the Middle East. Next, stop in Um Quais, site of the Gadarene swine miracle. Visiting: Al-Qudd / Al-Aqso Mosque, Dome of the Rock, Al-Mokaber Mountain, and Propert Daud. Visit: Mount Hebron, Masjid Al-ibrahim, El-Khader, Burak Solomon. A full day tour: Dead Sea, Shouaib Prophet, Ahl al-Kahf, then visit Abdullah Mosque, tour to the city Amman and after dinner transfer to the water port. 2 nights acomodasi at Ramada hotel in Amman. Porters, personal items and extra beverages on meals. Mount Hebron, Masjid Al-ibrahim, El-Khader, Burak Solomon. Visiting: Al-Qudd / Al-Aqso Mosque, Dome of the Rock, Al-Mokaber Mountain, and Prophet Daud. 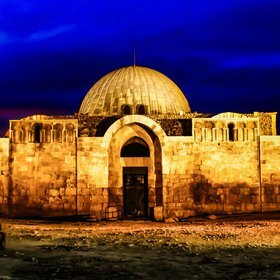 A full day tour: Dead Sea, Shouaib Prophet, Ahlal-Kahf, then visit Abdullah Mosque, Amman city tour to and after Dinner transfer to hotel, free program. Visiting the Dead Sea for lunch and then we transfer you to the water port after dinner. RJ-721 00:45 - 01:45. Land Transfer. Land Transfer. Full day Tour. Free Program.EK-904 17:30 - 21:15. Berkumpul di bandara Soekarno-Hatta terminal 2D untuk memulai perjalanan tour kita menuju Amman. Semoga Tuhan menyertai dan memberkati selama perjalanan kita. 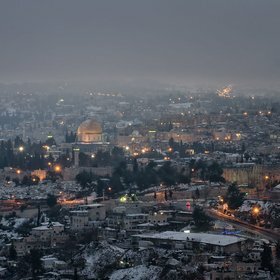 Tiba di Amman, setelah proses Imigrasi di Allenby Bridge (perbatasan antara Israel dengan Jordania), kita menuju Laut Mati yang terkenal dengan kandungan mineral dan garam yang sangat bagus untuk kulit dan Anda bisa menikmati mengambang disana. Setelah itu menuju Tiberias untuk bermalam. Setelah sarapan pagi kita akan diajak city tour keliling Danau Galilea. Dimulai dari Tabgha dimana Gereja Penggandaan Roti dan Ikan tempat Yesus membuat mukjizat memberi makan 5000 orang (Mat. 14:13-21), Bukit Sabda Bahagia tempat Yesus mengajarkan Sabda Bahagia kepada murid-Nya (Mat. 5:1-3), Gereja Primat Petrus tempat Yesus menampakkan diri kepada murid-Nya setelah kebangkitan-Nya (Yoh. 21:4-17). Kapernaum dimana Yesus melakukan banyak mukjizatnya. Setelah makan siang ikan petrus yang terkenal ke Gereja Transfigurasi di Gunung Tabor tempat Yesus dimuliakan bersama Musa dan Elia (Mat. 17:1-2). Sore hari ke Sungai Yordan dimana kita bisa melakukan pembaharuan Janji Baptis. Hari ini ke Nazareth mengunjungi Gereja Kabar Bahagia, tempat Maria menerima kabar gembira bahwa dia akan mengandung bayi Yesus (Luke 1:31) kemudian menuju Kana tempat Yesus melakukan mukjizat yang pertama mengubah air menjadi anggur (Yoh. 21:1-11). Siang hari menuju Jerusalem dengan melewati kota pelabuhan yang cantik Haifa di Gunung Karmel. Setiba di Jerusalem menuju Gereja St. Peter Galicantu di Bukit Zion. Pagi ini kita mengunjungi gua tempat Yesus dilahirkan di Gereja Nativity Bethlehem (Luk. 2:7). Dilanjutkan city tour ke Kapel Kenaikan Yesus ke Surga di Bukit Zaitun (Luk. 24:50-51), Gereja Bapa Kami tempat Yesus mengajarkan Doa Bapa Kami kepada para murid (Luk. 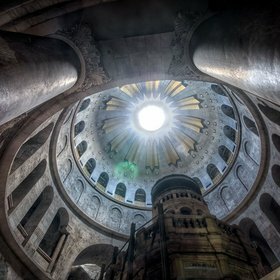 11:1-4), Dominus Flevit tempat Yesus menangisi kota Jerusalem dan Gereja Gethsemane tempat Yesus ditangkap (Mrk. 14:32-35). Pagi hari ke Gereja St. Anna, Kolam Bethesda, menyusuri Via Dolorosa menuju Golgota tempat Yesus disalibkan. Kemudian ke Tembok Ratapan di bukit Muria dan. Bukit Zion untuk melihat Kubur Daud, Ruang Perjamuan Terakhir. Qumran tempat dimana gulungan kitab suci tertua di temukan, Jericho untuk melihat pohon Ara Sykhamor dan Gunung Pencobaan Yesus dan Anda bisa berbelanja produk laut Mati. Hari ini kita meninggalkan Jerusalem menuju Mesir untuk mengunjungi Gunung Sinai di St. Catherine tempat Musa menerima 10 perintah Allah. Mendaki Gunung Sinai pada dini hari (unta optional), kemudian perjalanan menuju Cairo melewati Rafidim, Elim dan sumur Mara. Juga melewati terowongan Suez yang terkenal. Bermalam di Cairo. 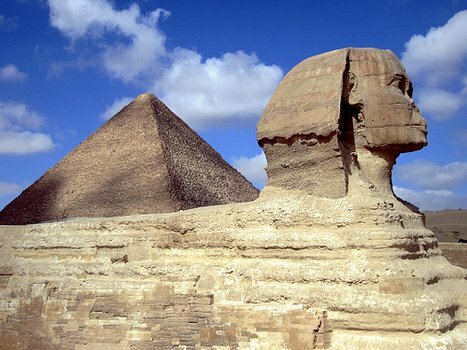 City tour kota Cairo mengunjungi daerah Giza untuk melihat Pyramid Raja Cheops dan Chepren, Sphinx. Kemudian ke Institut papyrus dimana kita bisa melihat cara orang Mesir kuno membuat kertas pertama. Kemudian ke Gereja Abu Serga (konon adalah tempat tinggal Keluarga Kudus saat mengungsi ke Mesir) (Mat. 2:3), Hanging Church atau Gereja Gantung dan Synagoge Ben Ezra Malam hari Anda bisa mengikuti Optional makan malam di atas Cruise di atas Sungai Nile. Pagi hari ke Gereja Sampah (St. Simon the Tunner) di Bukit Mukatam sebelum diantar ke airport untuk penerbangan ke tanah air. Kembali ke Jakarta. 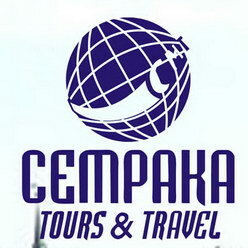 Terima kasih atas kepercayaan Anda kepada Era Tour. Sampai jumpa pada acara tour kami yang lainnya. Tuhan Memberkati. Pengeluaran pribadi dan optional tour. Tidak ada pengembalian DP bila pembatalan dari pihak peserta.